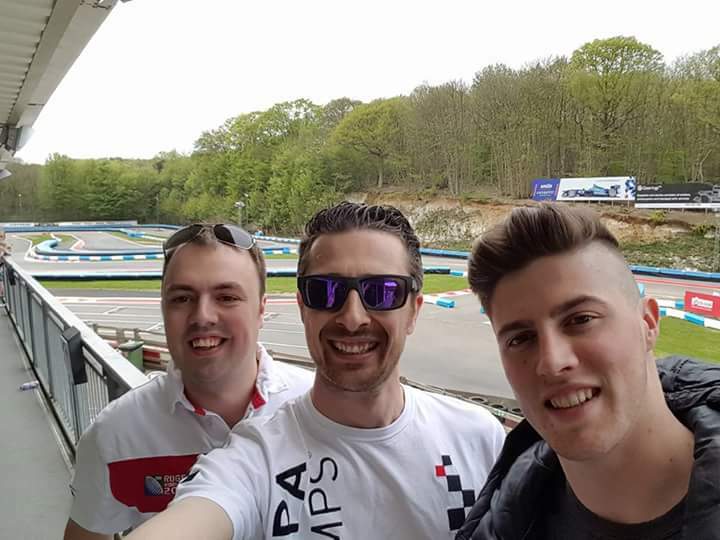 After a long wait, I finally managed to get around to taking part in this Karting for Heroes event with a couple of drivers that I’ve got to know through the BRKC. This race was going to be completely out of my comfort zone; I have not done a lot of outdoor karting (in fact, I had only ever driven a kart outside twice before the day of the race) and I had also only ever driven in a race this long once before and, even then, we had twice the number of people in our team! However, with Mike and Lee, I knew we had a strong team and we were aiming high. It was quite an enjoyable drive to Buckmore Park, and we all met up at a service station on the M25 around lunchtime to get the important team tactics sorted before arriving at the track. As some of you will know, I am a stickler for organisation and would usually have started on the planning well before the day of the race, but due to this being my first outdoor endurance, we left the driver order to fate (or, more precisely, three different length twigs from a hedge at Clacket Lane). As we all had a long drive to get to Buckmore, we allowed ourselves plenty of time to get there and as a result, arrived about an hour too early for the race. We were glad that we had got there in plenty of time, but then became impatient to get out on track and race! After the mandatory safety briefing and the secret donations for our grid positions were handed in, it was time for a short practice session – it was to be Mike’s and my first chance to drive on the circuit and our only opportunity to learn as much about the braking points and the flow of the track before the race started. I was second into the kart, after Lee, and I have to admit that I struggled; getting to top speed wasn’t an issue, but the braking points and kart stability was a big problem. I was hitting around the 52-53 second mark, so I wasn’t massively off the pace, but it didn’t feel right. I also had an issue with my helmet camera (which couldn’t be a helmet camera, but had to be a shoulder camera instead!). I like to be able to turn and lean my head, to be aware of drivers around me and to move with the kart. One incident that highlighted my lack of visibility was at turn one, where a driver tried to go around the outside of me as I was moving towards the racing line. Fortunately, I just managed to notice him in time, and avoid making contact. Having the camera on my shoulder just didn’t work for me and consequently went into my bag for the race. I knew that there was a lot of work to do, but we were looking quite consistent as a team, even if we only had the 10th quickest time after practice. Our donation put us 14th on the grid, so Lee had all it to do to keep it clean into the first corner and to cut through the field in the first 15 minutes. The atmosphere at Buckmore was fantastic and I decided, as a spectator, to record the start of the race and the fanfare from the Royal Engineers at the start. It was all too quickly my turn in the driving seat and, after Lee had taken us well inside the top ten, I was concerned that I was going to lose us the places that Lee had gained. I started shakily, probably being too cautious, but at the same time, I was knocked around on the second hairpin a couple of times and ended up facing the wrong way after clashes with back markers. At the end of my first stint, I handed over to Mike in 11th place, having lost a few places on track. I was really disappointed with myself – at the bare minimum, I wanted to hand the kart back in the same position that I got it in. There was a lot going on throughout the event; I took the opportunity to have a caricature done of me between my first and second stints (see below), but there were also photographers, music and food and drink in the clubhouse if you could tear yourself away from the karting action for a few minutes. After taking some advice from Lee before my second stint, I felt more at ease in the kart and on the track (although it was still far from perfect). I did improve in lap times, position and consistency during this stint and handed the kart back in fifth, albeit slightly further behind fourth place than we were before. We had to refuel during the race, and it was a difficult decision; do we aim to run the tank dry and then refill, do we play it safe and refuel at halfway, or do we refuel early, hoping that we judge it so that the kart is the lightest at the end? We played it safe and filled up after each of us had completed half of our race distance, partly because I had seen a couple of teams have to wait for refuelling after pulling in behind another kart. The longer that the race went on, the more confident we were of finishing fifth; in neither of my two remaining stints did I truly trouble the karts in front, but I was pleased to only have lost one place in my third stint, and held on to fifth in my final stint despite me having a couple of big “offs” over the course of my final 30 minutes. Lee and Mike did a fantastic job of bringing us home without any more drama in the last half hour and we did very well as a team to avoid any penalties at all throughout the whole three hours. In the end, although we were all exhausted, we were really pleased to have finished 5th against some very competitive and professional teams – it was truly a team effort with all of us offering advice to each other throughout the course of the day, however, we have already agreed that next year, we will be back and aiming for at least a podium! As soon as Mike and I had recovered from the endurance race, we returned to the track for our own birthday freebies. It was a lovely day outside and the lighting was really good for my helmet camera footage (and Mike’s if he hadn’t put the microSD card in the wrong way round!). Anyway, this afternoon’s racing had a completely different mindset for me; whilst I wanted to blow everyone away with a super-fast lap time, I also wanted to have fun and overtake in a more relaxed environment. I was fortunate to achieve both in the first session. Although there were a lot of us out on the circuit, the track seemed pretty open and there was ample opportunity to get clear air and set good lap times. I topped the leaderboard from start to finish, and managed to achieve a 23.547s lap (which would have been a new PB before Thursday) on lap 22. Mike finished in second place a little over six-tenths behind me. I was expecting more of the same in the next session and, this time, Mike was recording! Unfortunately for me, in this session, the other drivers seemed to be far more aggressive with defending their position on track and, therefore, there was a lot more traffic to deal with. My lap times were very consistent, with all of them around or under the 24s mark but, after Mike’s spin left him in space, this was where he took full advantage of me being stuck in the middle of several big battles. There was a lot of “squeezing” going on, where I was at least halfway alongside in an overtake and I was pushed into the barriers. This got me psychologically involved in the scraps, and rather than backing off and putting in a faster lap, I was determined to get past. In the last few laps, there were a number of yellow and red flags, which also prevented me from pushing on to better lap times. At the end of the race, Mike achieved the fastest lap of the session with a 23.466s lap, whereas I only managed a 23.504s lap, leaving me third. I had a lot of fun this afternoon, even if my competitive side was disappointed with the third place finish at the end. Looking forward, I can’t wait to go outdoors again soon and also to kart in Abu Dhabi and Dubai in May! In celebration of Ian Burnell-Fraser’s 51st birthday, 36 of the best karters in the south descended on Eastleigh for a team endurance race. Myself and Mike lined up again as “The Broad Band”, but with a change in personnel on the track as Nick is now excluded from taking part due to medical reasons. Originally, we were due to be joined by my work colleague, Jonathan (who competed in the opposing team last time out), but unfortunately, he also had to pull out at the last minute due to illness. But, fortunately, we were ably assisted by another member, Steve, to share the 130 minutes of karting between us. Although there was a party feeling when we arrived and a lot of reunions with people who we hadn’t seen for a while, the pleasantries tailed off the further into the evening that we found ourselves and once the karts were started (even in the practice session), the atmosphere was intense. Steve took the baton first in our practice session and set some very quick times in his 6 minutes of practice, getting us into second place briefly. I followed and took to the kart after Steve. Whilst I felt that there were some minor issues with the acceleration of the kart, I was happy and feeling that we could be competitive in the race. The practice session was fairly uneventful for me; I kept it clean, pulled off a couple of on-track overtakes on others and was only overtaken myself once. I decided that after the practice session that our running order should be myself, followed by Mike, leaving Steve to bring us home. As with our last endurance race we, unfortunately, had to line up towards the back of the grid. I made a decent start, but I didn’t make up any places into the first corner, or as many as I would have liked in the first few laps, to springboard forward in the field. What I did do, however, was to keep in contact with the drivers in front and reel them in as they were battling with each other. I apparently made it up to fifth place before dropping back down the order, over my 36 minute spell, to eighth position. I’m reluctant to blame the kart, but when at a full stop or slow section with drivers in front, the kart simply did not accelerate away, which at times made it impossible to defend my position. I was desperate to communicate with my team mates during my stint, and you can see me in the video waving my hands trying to get Nick (who had come to spectate anyway) and Mike’s attention to firstly see how long I had left in my stint, and secondly, if I had a lot of time left to let them know about how I was feeling – towards the end of my stint, I could feel that my right hand was getting blistered and my left hand felt wet, rather like a blister had formed and then popped (after taking my gloves off, it turned out that I had actually drawn a little blood). They didn’t see me (or chose to ignore me!) so I had no idea what was happening. As I’ve said before, once you put your helmet on, you are left with only your own thoughts because it isn’t easy to communicate with anyone else whilst racing! I nursed the kart (and my hands) through the next few laps (especially after the red flag) and brought it in for the changeover at the end of my stint. I was delighted when I found out that I had annihilated my PB by over a second with a 22.695s lap during my stint in the race, but in the same moment, I was disappointed not to have handed over in a better position. My complaint seemed to be justified as a couple of laps after my handover to Mike, he came into the pits to swap karts as it had completely given up (as you can see about a minute into Mike’s footage, again on YouTube, (https://youtu.be/_4akpYPQdUg)). Mike did a great job in the new kart and, although he didn’t make up any positions, he did cement our position, pulling away from the ninth place team and staying in contact with 5th, 6th and 7th positions. Once Mike’s gruelling stint was over, Steve (on paper, our fastest driver here based on previous PBs) had the unenviable task of trying to pull us back into contention. Alas, after an hour and fifty minutes of flat-out racing, this was a challenge too far, and an eighth place finish was always on the cards for us. Given the level of competition on this night, we had all entered into it as “entertainment” rather than thinking we would get anywhere near the win – I think we all agreed, this was an intense, exciting and ultimately enjoyable evening. I would like to add my thanks to Ian, Sara and Amy-Louise for organising and running a fantastic event and thank Ian again for his donation to my charity appeal (collecting enough pennies to stretch the 1.1 miles between two churches in my local area). Welcome to the first instalment of my competitive outdoor karting “career”! After turning 29 at the weekend, and with the “Karting for Heroes” endurance race on the horizon, I decided to pop over to Thruxton to open my account there and get some time behind the wheel outdoors. I took part in their “Race Night” event, against some very experienced competitors both at this track and in UK outdoor karting championships. The format was quite straightforward; 8 minute practice/qualifying and an 8 lap heat, finishing with a 10 lap final (alternating with the other group). It was a glorious evening when I arrived (after I was predicting a wet/greasy track from the weather forecast!) and by the time we took to the track for the practice/qualifying session, the sun was just setting in the distance. After the safety briefing, I got chatting with three of the drivers in our group, who wanted to remove a visor from a helmet to clean it. As I had removed (and replaced) visors many times before, I gave them a hand with it and instantly built up a rapport with them. The qualifying session was eye-opening for me; the sheer amount of power from the karts along with the space to accelerate and reach speeds around 60mph was awesome and at the same time, terrifying. In fact, although I’ve driven faster cars, including the Formula Renault, this was really the first time that I thought “Oh sh**!” and feared for my safety after missing a braking point and bouncing over a kerb perilously close to a tyre wall. I struggled with the circuit layout too in this session (the other drivers had all been around this track before and knew it to varying degrees), but I kept getting confused with the corners after the chicanes; one is a very tight hairpin whereas the other is an open, full-throttle, curve towards the start/finish line – very different entry speeds required! All those things aside, I didn’t disgrace myself in qualifying, finishing 5th out of 8th with a time of 53.455s. After qualifying, and whilst the other group went out for their heat, we had a brief period of respite where I carried on chatting to the three drivers that I met earlier. It wasn’t a long break – before we had chance to fully recover, we were out there lined up for our heat and the hard work started again. At this point in the evening, the sun was just above the horizon, so like in the first session, it was time to drop my helmet’s internal sunshield and go for it once again. I had clearly improved (or I was just a good starter) as I forced my way up into third place briefly at the first corner, before running off line and having to fall back into 5th. Despite a few laps where I was catching 4th place and breaking 60mph top speed, I finished 25s behind the leader and four seconds behind fourth place, whilst being 16s clear of 6th. I had gained a lot of confidence from this heat and I thought I maybe had an outside chance of a podium in the final. Unfortunately, one of the drivers who I had been talking to and racing, Vicky, had to pull out of the heat at half distance and the final due to a medical issue but, this did have its own advantages for us; we now had a photographer (the featured image and the one below were both brilliantly taken by her during the final – Thanks Vicky!). In the lead up to the final, I was buzzing with confidence and I got another fantastic start when the lights changed, mixing it up on the run up to the first corner. However, that was where it all went wrong – my kart was very slippery and as I tried to brake and turn into the first corner on the inside, I spun 180 degrees and just faced the drivers that were behind me (soon to be in front of me!). Once everyone was clear of me, I turned the kart around, and set off in pursuit of anybody to try to avoid finishing last. I did manage to catch two of the drivers within a couple of laps, but as I hadn’t overtaken anyone on this track before, I was trying to consider where the best places to overtake would be. I was very pleased that in successive corners, I managed to overtake both of them and from that point on, I was on my own, despite my increasingly desperate attempts to shave as much time as I could from my lap times. Surprisingly, I finished about the same distance behind the leaders as I had done in the heat, despite my initial mistake and the fact that the final was longer than the heat before! I did improve on my lap times in the final, and I now have a PB of 52.242s for the next time that I return to Thruxton! All in all, I was very satisfied with my first competitive outdoor karting session and I’ve got the bug to do more karting here and at other outdoor tracks (it’s just a shame that the price is quite prohibitive). A month after our victory in the team endurance, Mike and I decided to take part in a member’s event at the Eastleigh track. This was Mike’s first race against this level of competition, but we both thought it would be a worthwhile experiment to see where he would rank after a very short karting career to date. The Mansell format, although new to Mike, was familiar to me; 10 minutes qualifying before a 45 minute straight race from those grid positions, with “black flag” pit stops happening every 3 minutes. Qualifying was a bit of a blur; I thought the kart felt good, although there was a bit of lag with the mid-range acceleration. A couple of minutes from the end, there was a red flag stoppage, which also spelled the end of one driver’s participation in the event after a nasty crash into the pit lane entry barrier. This break in qualifying put paid to anyone bettering their lap times in the final few moments, resulting in me starting in sixth place on the grid, and Mike directly behind me on the grid in eighth. We lined up ready for the race start and I was buzzing in anticipation – I was targeting a podium this time and I knew I had to make some places up as soon as possible after the lights turned green. The start went exactly as I had hoped; I managed to gain a place after the first corner and a few laps later, managed to take advantage of a mistake by the driver in front to move up the order. I believe (although I can’t be sure of this) that I managed to get into second position. Unfortunately, this is where the race was to come to a premature end for all of the drivers. Due to a technical problem, the chequered flag came down and all of the drivers were directed to the pits (looking quite bewildered). We were told that the race would be restarted from our original grid positions and that the clock would be reset to the full 45 minutes – all of the effort I had put into those few laps was ultimately pointless. On the grid this time, I was very fidgety, even to the point of still moving in my seat when the lights turned green. The race was restarted and, although I managed to get into fifth place again after the first corner, I wasn’t able to push on from there like I had in the first “non-race”. My position peaked at third place early on but, whilst I could keep some of the guys behind me for periods of time leading up to my mandatory pit stop, I couldn’t maintain my position afterwards. My flow was interrupted when I was shunted from behind at the hairpin before the bridge. This incident brought out the red flag and genuinely shook me up. I tried to regroup, but the only thing that I could think of was getting that position back that had been unfairly taken from me. I tried to wipe this incident from my mind and just drive to the best of my ability, but numerous incidents were happening around the circuit (although they were dealt with by the marshals). Just before my pit stop, I managed to catch Mike and decided that I wouldn’t be rash and attempt a move that could end both of our races, so would stay behind him for a lap. This didn’t quite work out as planned either, because Mike went into the pits when I was flagged to come in! I ended the race in fifth place and managed a 24.043s best lap, with Mike a couple of laps down on me in sixth (which is no mean feat in his first members race). I feel that both myself and Mike need a little bit more variety in our racing, which may mean karting a little less regularly, but hitting different tracks (and maybe a bit of outdoor karting) as often as we can. Another quick karting trip with Mike and a couple of his friends, mainly in preparation for the team endurance on Tuesday evening. I was feeling a lot better in myself this week after shaking off the last of the virus that I had since the BRKC. The first session started really well and the kart felt fantastic; I was very happy with my karts throughout the afternoon (whilst they behaved completely differently, they were great and there was nothing to complain about at all). I went for it straight from the word go and maintained my position at the top of the timing sheets for 21 laps. Unfortunately, this wasn’t quite enough to “win” overall. Mike seemed to come out of nowhere to get in front me and exhibit some great defensive driving that I was ‘coaching’ him in last week. These few laps at the end were great fun and really tested my ability to follow closely and attempt to overtake. I finished the session in second place with a best lap of 24.348s, but with the best average lap time out of all of the drivers in that session. Mike finished just behind me in third spot, but having made massive improvements in all aspects of his karting. Both Mike and I were determined for the second session; I wanted to top the timesheets and Mike wanted to get both a better lap time and to practice his new lines around the track. From the pit lane, both of us went for it and were inseparable for the first four or five laps and, through our aggressive start, we were pulling away from the pack at pace. It was a brilliant battle, which I only managed to get the upper hand in due to a slight mistake by Mike at the “grandstand” hairpin, slipping off the racing line, and allowing me to squeeze through on the inside. There wasn’t too much action throughout this session; Mike was held up a little longer than I was behind the back markers, allowing me to just concentrate on my driving (although he was always just about one corner behind!). We achieved a one-two on the timesheets at the end of the afternoon’s karting; I set my fastest lap of the day, a 24.220, with Mike just fractionally slower than he was in the first session. I have to also mention that the standard of karting was far higher than last week’s session and the racing was both competitive and fair, which makes it a lot more fun for everyone. I have a lot of confidence and respect for my teammates for Tuesday’s endurance race – now we just need to turn it into a positive result! A bit of a fun session with my friend Mike (who has become a GRID member after our NYE session!) and my first outing indoors since the BRKC. Before I had even started, I suppose that a level of arrogance had crept into my mentality; I expected to be the fastest by quite a long way, having competed at one of the highest levels of indoor karting less than one month previously. This was soon to be knocked out of me; physically on the track and mentally when the results came out. I didn’t take the first session too seriously, but I tried to turn it on when I couldn’t pull away from Mike – in our last session, I was about a second a lap quicker – this time, he had very good pace and was keeping me honest. There were a few bashes and even more near-misses out on track due to the unpredictability of some of the drivers. I avoided a few drivers spinning in front of me (even if it did mean losing track position to Mike a couple of times!). I did, however, top the timesheets with a 24.778s, a little over half a second faster than Mike who managed to finish second in this session. Maybe because it was Valentines Day, the drivers wanted to get a little closer to one another in the second session, or maybe it was the usual confidence beating ability after one session. The second session was more competitive and much rougher and the “No Bumping” sign was shown quite a few times (even if some did not agree with it!). I tried to keep things as clean as possible but, in these sessions, some contact between karts is unavoidable. One incident, which I was involved in, that sticks in my mind started at the hairpin entry to the flyover; having followed the driver in front closely for a couple of laps, I saw them defend the inside line at the hairpin, so I deliberately held my outside line to try to cut up the inside on the exit. This worked well and the slightest of taps opened up the space for me to overtake. Once I was alongside and tried to push on, the driver that I had just overtaken turned in to me and bounced me up the on-ramp. One lap later, the marshals showed him the no bumping sign which he felt very aggrieved about, gesticulating from his kart. I finished first in this session with a 27.707s lap, far more consistent than the first, with Mike a little closer behind me again in second place. With all things considered, this was an average session for me – I want to, and need to, do better in the endurance race on the 23rd. Drawing some positives for the endurance race, Mike has improved dramatically and with a little bit of coaching in racecraft, he will be a fantastic team mate on Tuesday evening! My BRKC 2016 heats continued with a very early and wintery start to Sunday. Whilst the temperatures may have been sub-zero outside, the action certainly heated up on the track. In round three, I was part of the first race on track, which included fierce opposition throughout the field; at the front there was Annelien Boutens and Anwar Beroual Smith, but lots of other drivers were in the mix. I had set myself a target of 7th going into the championship, but some drivers that I hadn’t necessarily counted on being competitive had been excellent in their first two heats. I blasted through my qualifying lap; given my previous history with qualifying, I have no idea how I managed to just get my head down, pull a 34.587s lap time out of the bag and qualify 8th. I felt very comfortable in the kart throughout this heat, even if I still was half asleep. I also managed to pull my only couple of on-track overtakes of the weekend thus far, one of which I was very happy with through the snail section of the track. After overtaking Sebastian Raikkonen (after my pit stop), he tried a manoeuvre at the end of the back straight to get back at me and, unfortunately for him, span causing a yellow flag and the karts to be speed limited. After following the driver in front closely, we were back to racing pace as we entered the snail section. I went to the inside as he moved to the outside and he had no way to defend my move. However, I then went wide at the second hairpin leaving him the inside line for the long left hander. I had to hold on for my life as I kept my foot down around the outside, leaving just enough room for the driver on my inside but squeezing as much as I legally could. Fortunately, I managed to get a kart length in front and I slotted into position in front. Towards the end of the race, there was a little bit of bumping that I was involved in. Due to the leaders not pitting until late on, and myself taking my now customary early pitstop they had caught up with me a few laps from the end. I had no idea who was behind me when I felt a huge whack from behind. And then again. It was only when the blue flag came out at race control that I realised that Annelien had been following me for the past four corners. Despite what may have been said, I didn’t deliberately hold anyone up – I felt like I was under pressure from the driver in 8th place (as it happens, 8th place finished 0.8s behind me at the end of the race) and as I have been told before, always race to the flags/lights. I finished 7th with a best lap time of 32.665s, only a quarter of a second off the fastest laps from the top two drivers in this heat. With very little to race for in my final heat, my body aching and a difficult line up to face, I was always going to be up against it. A number of people had dropped out as they had long journeys home and had no chance of making the semi-finals. This aside, there was a lot of excitement as this was the penultimate heat before the semi-finals and as such, there were many more distractions in the gallery and pit lane; notably, there was now a pit lane cameraman, which was a fantastic experience and a chance to show my thanks to my “fans” following my progress online (which was very much appreciated apparently). From the first corner in qualifying, it was clear that I was exhausted; I was turning into the corners and just going through the motions. I had a poor pit stop on lap four, after a brief position change, and then it was just me on my own for lap after lap. I did dip under the 35s mark twice, but it was a pretty unspectacular race for me, and a damp squib to end my championship weekend on. In the final leaderboard, I achieved 74th place with a points tally of 15; 11 more points than last year which, coincidentally, is also the number of kilograms that I have lost in body weight since BRKC2015! I was incredibly happy with my performance over the weekend, but as I believe many drivers would say about their results, I felt that I could have got a couple more points, or climbed up a few more places. After a relaxing time in the hotel spa and sauna, it was time for the BRKC Grand Final, which on paper was due to be the best yet. My wife and I planned to watch the final on the Livestream in the comfort of our hotel room, but due to technical difficulties during qualifying, we decided to make a dash to the track and managed to get there after half of the finalists had set their lap times. Once the final had started, there was action at every corner and with every driver – It was impossible to turn away for a second and not miss some of the action. Once Rubens had taken the lead there was a feeling of inevitability; throughout the weekend, once Rubens had taken the lead, he seemed to find another gear. On this occasion, however, it wasn’t a done deal – Lewis Manley, Lee Hackett and Stefan Verhofste were keeping in touch. It was incredibly difficult to see who had pitted, who hadn’t, who had pitted illegally and who needed to pit again; at one point, we all thought in the spectator area that Stefan just needed to defend from Rubens for five or so minutes to become the British champion (this wasn’t the case as Stefan had to pit once more). In the end, as with the previous two years, Rubens came out on top and took the trophy, KWC entry and cash back to Holland and, I can say that he thoroughly deserved the win after being the outstanding driver over the entire competition. Roll on #BRKC2017, where I will be slimmer, fitter, and more experienced (but then again, so will the other 99 drivers! ).